Kitchen Tune-Up franchise business opportunity. Free Kitchen Tune-Up business franchise information. Kitchen Tune-Up is looking for owners who want to manage a business. Owners will manage salespeople, technicians and sub-contractors. With our unique system we can offer a wide variety of kitchen remodeling options to satisfy our clients’ wants and needs, and stay within their budget. New Custom Cabinetry, Cabinet Re-facing, one-day Cabinet Restoration & Reconditioning, complete interior Wood Restoration including our no-sanding Restore-Your-Floor process, BTU Tub & Shower Lining Systems, Closet Organization Systems and our Cabinet Accessories. Kitchens have become the heart and soul of most homes. Wood is everywhere! 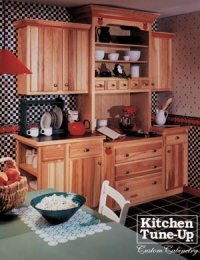 In addition to kitchen cabinets, there's furniture, paneling, bathroom vanities, desks, wood floors and more. We service both residential and commercial accounts. We have performed our services for such clients as Pizza Hut®, TGI Friday’s®, Radisson® and Marriott® hotels, Super 8® and Days Inn® motels, Wells Fargo® and U.S. Bank® banks, and many other satisfied customers! Manage a home improvement franchise with subcontractors and technicians doing the work and salespeople handling the sales calls. Limitless potential because we are the only franchise company offering this combination of services. Today's busy homeowners are looking for affordable ways to remodel. When replacing kitchen cabinets, we use state-of-the-art, computerized color drawings to show our clients how their new kitchen will look. Think of the sales and profit possibilities as your clients imagine their new kitchen! Today's consumers are demanding quality, service and value. By re-facing or restoring instead of replacing, you will be saving your clients time, inconvenience and, most importantly, money. Kitchen Tune-Up brings many valuable services right to the homeowner's front door. Why should you join a #1 rated franchise? With our nationwide buying power and personal attention, KTU offers an invaluable product and service! Understanding the clients’ wants and needs has played a significant part in our success, but our core and backbone always have been and always will be - YOU - our franchise owners. Let's face it, if our franchise owners don't succeed, we don't succeed. We offer our franchisees a system they can build on. With complete initial training, on-the-job training, ongoing support and follow up, we give our franchise owners all the tools they need to succeed. All you need are the motivation and desire for success. That's why Entrepreneur has rated Kitchen Tune-Up #1 the last nine years in its category. Three ways to go & three ways to grow! Recommended location is a strip mall - we will help find the site! This would be open normal business hours with even more convenience for customers! To learn more about the Kitchen Tune-Up home improvement franchise opportunity, simply complete the form below.